Summer Dilemmas-Would You Ban Music From Parked Ice Cream Trucks? All I can say is what next? 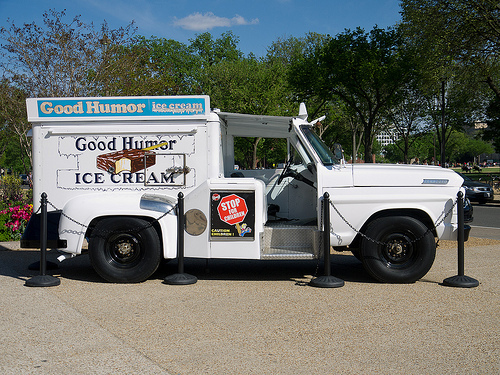 Years ago, the Good Humor truck had bells,which the driver had to manually jingle when he was approaching his stops. He also made regular neighborhood stops near my home in a very large New York suburb. It did make me think however, that I do avoid the ice cream truck on a regular basis and try to make healthier choices like frozen yogurt. I may be only fooling myself but it makes me feel better. The issue is also raised about how the ordinance may effect the safety of children around the trucks. “If they stop playing music, then the driver is driving by (and the kids) won’t notice there is an ice cream truck and they might hit the kids,” Ice cream supplier Bob Bakshi said. via Long Beach Looks To Ban Music From Parked Ice Cream Trucks « CBS Los Angeles. This entry was posted in Feeding, Fun, Kids, Parenting by llpitlwp. Bookmark the permalink.